Reality Check: Are Google's Driverless Cars Right Around the Corner or Still a Distant Pipedream? It’s hard not to get hyped watching roboticist Chris Urmson demonstrate Google’s self-driving car technology in a recent TED Talk. Using really expensive multi-directional lasers, 3D mapping, and a lot of artificial intelligence to see and navigate the road, the company’s fleet of 23 modified Lexus Hybrids and 25 adorable Google-built prototypes have successfully driven 1.5 million miles on California, Texas, Washington, and Arizona roads. After only a few fender-benders that Google claims are “not our fault!”—my words, not theirs—the public trials have so far proven that car safety skyrockets when you remove drivers from the equation. Urmson and his team at Google are so encouraged, in fact, they’re working towards a 2020 release date, which is fewer than five years away (if my math is correct). What are the odds they meet their soft deadline? 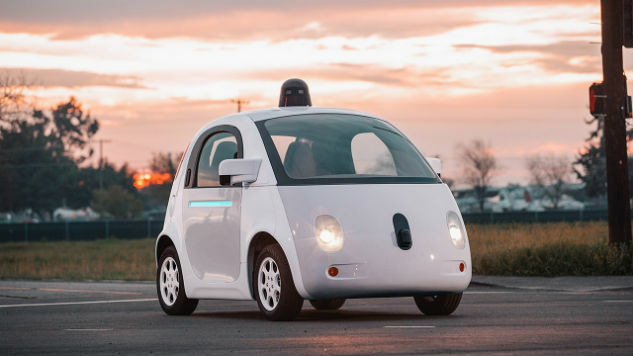 Acclaimed designer and driverless researcher Don Norman of UC San Diego believes Google will likely realize that ambitious goal, but only in limited use on restricted corporate campus streets—similar to those fancy golf carts you sometimes see at college. For everything else, however, including entering and exiting highways, maneuvering city streets, and limited rural use, Norman says we won’t see fully autonomous cars on major roads “for 10 more years at the earliest.” And even then, driverless cars will make up a mixed-use minority among a manual driving majority. The reason: “We can handle most of the scenarios, but we still can’t handle the extreme cases where accidents mostly occur,” he says. Things like abnormal stop and go and behavior, unruly pedestrians, construction detours, poorly marked or graveled county roads, and different right of way rules for different types of vehicles, such as school buses, ambulances, and police cars. In addition to those issues, other roadblocks are causing delays. For instance, “none of the systems work well in rain, fog, or snow,” Norman explains. This is because precipitation largely blinds the lasers’ (or lidar’s) ability to see and ultimately drive safely. Furthermore, unmarked or even poorly marked lanes can lead to accidents, as was the case when a self-driving car struck a bus recently. There were no injuries, but the accident was certainly disconcerting. Programming the cars to safely pull over when situations or weather becomes dicey is one way to handle unpredictability. But that behavior could lead to further delays, frustration, and perhaps even more road rage. Consequently, skeptics and safety officials cite the above reasons as proof that driverless cars are far from being fit for the road. But Norman says perfection was never the goal. “Imperfect computers fail less often than reckless humans,” he says. In fact, the number of car deaths in America has dropped 25% annually over the last decade. This is primarily due to the smarter, driver-assisted cars already on the road. “I have friends today that go 10-20 miles on the highway and only reach for the wheel when their Lexus, Tesla, Nissan, or Mercedes insist,” Norman says. As far and fast as we’ve gotten to this point, however, both Norman and D’Ambrosio believe we must temper our expectations. Yes, driverless vehicles are well-intentioned, mostly amazing, and nearly there. But the final steps and ultimate transition will likely take two to three times what Google is shooting for. “If not 2025, certainly 2030,” Norman predicts. Blake Snow writes epic stories for fancy publications and Fortune 500 companies. He serves as Paste Magazine’s Off The Grid columnist and can be followed @blakesnow.